Drive at 65 km/h, or evil monster kangaroos will flip your car and eat you up alive! wow.....should I summon Ultraman or Power Rangers? should I summon Ultraman or Power Rangers? Is it really a giant monster kangaroo, or is the guy just driving a really tiny car? We probably need a few of those monster kangaroos in Malaysia to keep the rempits under control. Damn ROOS are gonna impregnate your car if you go too fast!! Dayaamnn! Hahaha, nice one. I've been to australia before, but didn't come across that roadsign before :). More like a case of toleration from both sides. I've heard from my boss that there's a case where the kangaroo was so shocked by the car's sudden appearance (it was driven at high speed) that it jumped and broke through the windscreen, killing the driver instantly. It's not always the car that kills the kangaroo. So it's either you die or the kangaroo die in an accident. Be it u kill a kangaroo and mash it up under your tyre, or a wombat, or a 'devil. Whatever. 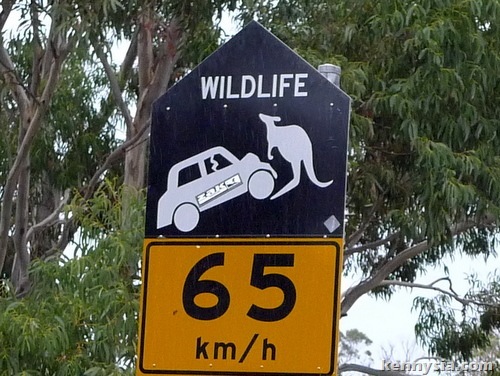 Looks more like if you drive more than 65, those roos gonna hump your car. got once we drive 120 km/h & bang on a big kangaroo..
tot the kangaroo pic should replaced by a rempit pic~~? Omg kennyfatboysia your jokes are soooooo funny!! Are your target audience the 3-7 year olds?? And before any of you wankers who wants to defend him. c'mone.. dont b so harsh 2 faghater.. he just haven master computer skills yet(clicking away from sites he hates, etc.) at least he's learning 2 leave comments..
How weird..I'm just writing about you now, and didn't know you were in Australia. Are you coming to Sydney? kenny bah..write more pls ..
Kangeroos are very strong animals and are known to cause a lot of damage to vehicles. That's why, you will see car having bull bars at the front especially for those who live in regional areas or travel to those regions regularly. animal sometimes can be dangerous. They can really be evil! A kangaroo jumped into the car i was driving! I WILL EAT THE KANGAROOS BEFORE THEY EAT ME... WAIT... I'VE EATEN KANGAROO MEAT MARINATED WITH PEPPER SAUCE FROM WOOLWORTHS... OH WAI-!